It is still working - as planned! I like to build things strong. REAL STRONG. Because many of the things we build are used by the public there is no second chance on something that fails. The cure is to way over build. I hate failures and callbacks.
. And we triple coated when we did all of our painting. Because of that everything lasted and lasted well. This included areas that could have been impacted by frost heaves or tree roots. The concrete walkway didn't crack nor did anything else we built. The paint still looks good too. Our current large project is for the same folks who bought Giggle Ridge and a few of the adjoining areas of the two parks need to adjusted and blended. This means some walkways and fences will have to be demolished and removed before building new. When I was told of the plans it made me smile for I knew what was hidden under the pretty features and walkways. Chris figured his crew would spend a half day removing one of the gates and some fencing. The crew carefully cut away the steel fence and then brought in the backhoe to take out the walkway and faux stone wall. They didn't get far. 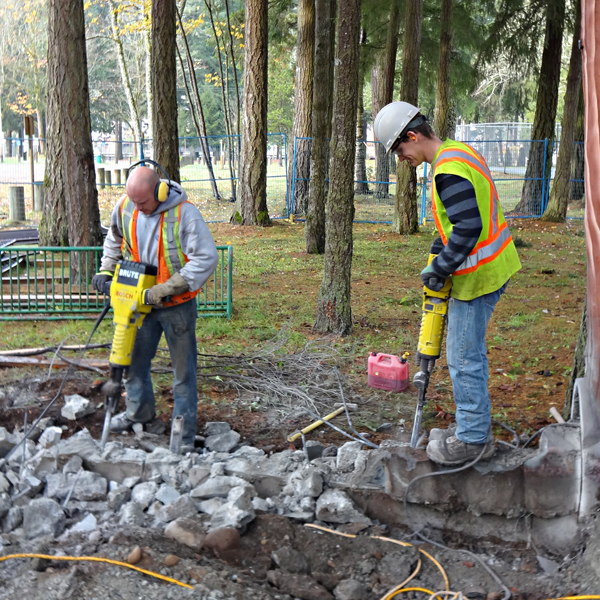 The concrete walls and footings were just too tough for the big machine. After two full days with jackhammers Chris' hardworking crew finally managed to get things low enough to build the footings for the new building. Chris has a new appreciation of the park he bought from us and for the work we are currently doing for him too. He knows it is built to last. Sometimes upside down is the right way up.